Friday…we’re in love with botanical entertaining and this Chilled Strawberry Balsamic Soup is the tastiest (and prettiest) addition to your weekend rendezvous! The refreshing recipe is perfect for a picnic, a brunch, or a fabulous dinner party. Serve it as a darling amuse-bouche or adjust the portions to make it a true first course. Enjoy! Put the strawberries, tomatoes, agave, salt, pepper (to taste), oil, and vinegar in a blender and blend until smooth. Taste and add a little more strawberry (if not sweet enough) and/or tomato (if not acidic enough), then blend again. Transfer the soup to a large bowl, cover with plastic wrap, and chill in the refrigerator for as long as possible, but serve the same day. Pour the soup into eight small, preferably chilled glasses. Drizzle with oil and vinegar and dust with a pinch of black pepper. 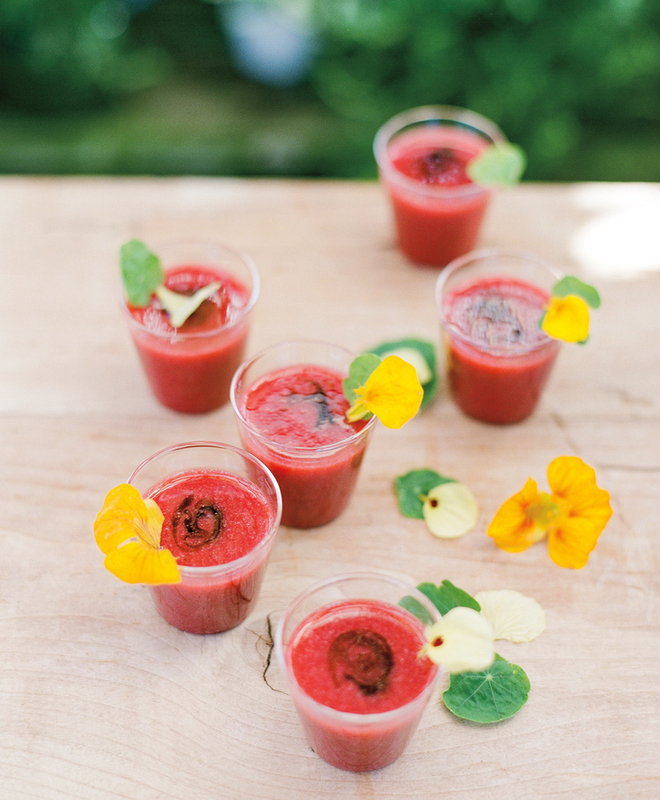 Garnish each glass with a nasturtium leaf and petal and serve.